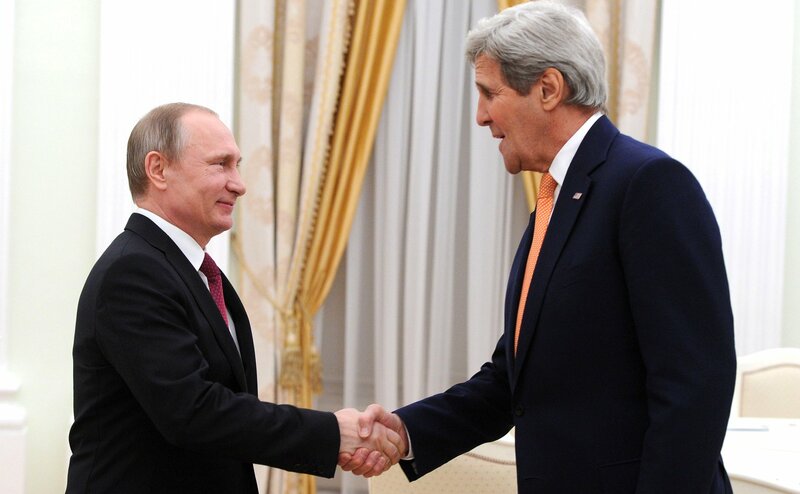 There has been a serious drop in the level of violence in Syria and an increase in humanitarian aid deliveries to this country, U.S. Secretary of State John Kerry said at a meeting with Russian President Vladimir Putin in Moscow on March 24. As a result of these efforts, the Syrian population, and the population of the region, were able to see the tangible benefits offered by the ceasefire, he said. Kerry noted that many observers thought it would be impossible to ensure a ceasefire in Syria but this Sunday (March 27) will mark the first month since the truce began. The secretary stressed that this was achieved thanks to the military and political cooperation between Russia and the U.S.
Kerry told Putin that he is looking forward to discussing what can be done to restore and strengthen relations with Russia by demonstrating that together the two countries can take on challenging global problems. In turn, the Russian president said that the results on Syria were achieved thanks to the position of U.S. leadership. "We understand that what we were able to do in Syria could only be achieved due to the position of the U.S. top political leadership, the position of President Obama," Putin said. "I am very hopeful that your visit will enable us to narrow the gap on issues concerning both the further settlement of the Syrian problem and, as you mentioned, the Ukrainian one," the president said. At the beginning of the meeting Kerry also expressed condolences over the recent air crash in Russia's Rostov-on-Don on behalf of U.S. President Barack Obama and the American people.